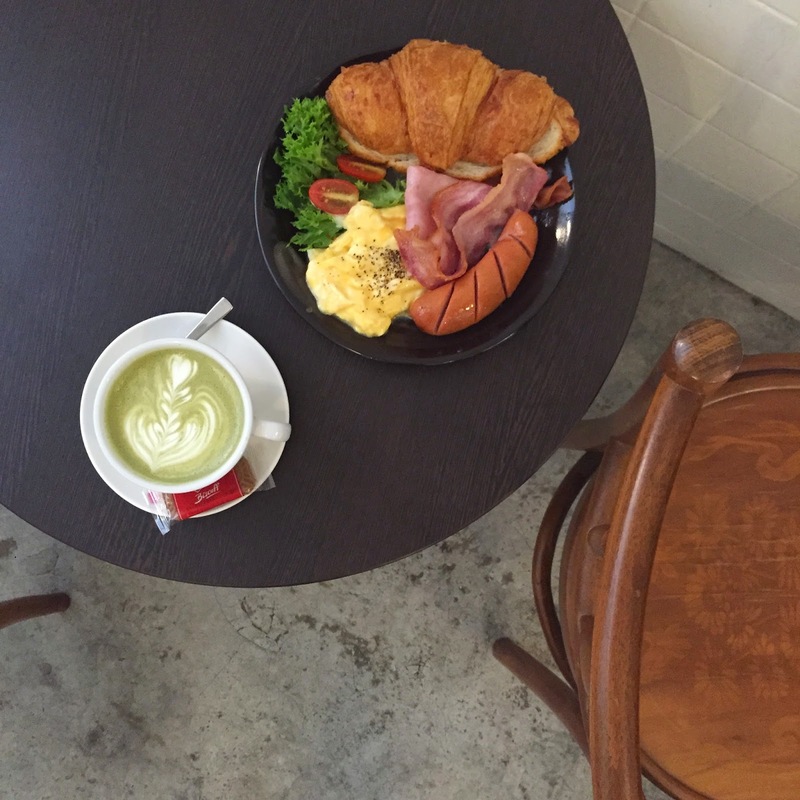 The Coffee Daily, Serangoon Garden Estate | JACQSOWHAT: Food. Travel. Lifestyle. I have been to Serangoon Gardens several times for food but sadly have never been to The Coffee Daily until recently. The Coffee Daily is one of the coffee joint in the explosive cafe scene - serving good coffee, brunch, waffle w ice cream as well as their highly raved rainbow cakes. It is located in Serangoon Gardens estate at Brighton Crescent, where by shophouse was formerly owned by Awfully Chocolate. We were greeted with a smile upon entering on a warm weekday, always like friendly and welcoming staff. It is a cosy place to chill and do your work especially with free wifi and of course good coffee. The cafe concept leans towards the vintage style with old looking furnitures as well as flooring without tiles. The menu is rather extensive considering the shoebox kitchen or even smaller. They serve a range of mains, all day breakfast, sandwiches, waffles with ice cream and a good selection of desserts and cakes on display. Decided to go ahead with one of their brunch item which comes with a set. The set includes a cup of Americano coffee but you're able to top up to any choice of your drinks. I went ahead with Matcha Latte $6 but with the set, I only need to top up $2. One of the brunch item, All Time American set $16.50/ ala carte $12.90. It is served with scrambled eggs, ham, pork bockwurst, streaky bacon, mixed greens and croissant. I like how they are generous in their serving especially the scrambled eggs, it was really nicely done. It's quite rare to get good scrambled eggs in cafe these days. Croissant was well toasted and crispy, plus point. My friend decided to went ahead with Baked Mac & Cheese $8.80. When it was served to us, we looked at each other with doubt because it didn't look appetising at all. The thick layer of oil and watery cheese didn't help much. After having a taste of it, I was rather amazed at the strong mozzarella cheese aroma. Lesson learnt: Never judge a food by the way it looks. At The Coffee Daily, they are known for their Rainbow cakes which has surfaced all over instagram for a period of time. Since we are here, how can we missed it right. Their Rainbow Cake $8.90 is served with quote written on the plate with chocolate sauce. The colourful sponges were stacked with layers of lemon cream cheese within and on the surface as well. I have seen prettier rainbow cakes served here with pastel shade of rainbow layers, but unfortunately ours was quite saturated making it look artificial. Nevertheless, the cake was moist and refreshing with a hint of citrus from the lemon cream cheese. One of the better rainbow cakes out there I would say. The Coffee Daily is a great place to visit if you're near the vicinity, though it is slightly out of the way as it is not near the MRT station. Good food and good coffee, I can't find any reason not to revisit especially if I'm looking for a place outside to get my work done. Also love the small gesture that they provide complimentary iced gem biscuits, self helping but of course take what you can eat.